Families trying to keep warm. 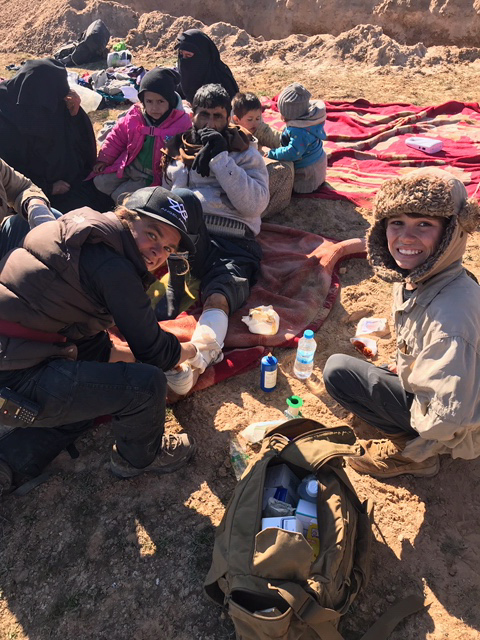 Over the past few days, our team has been treating wounded IDPs at a new collection site east of Sousa, over four hours from the nearest hospital and IDP camp. 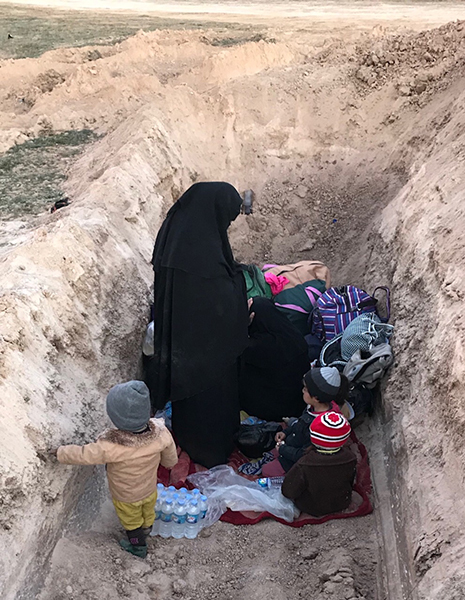 ISIS is surrounded now with their backs to the Euphrates River and families are fleeing out of the last ISIS stronghold in groups of 100-200 people a day now. 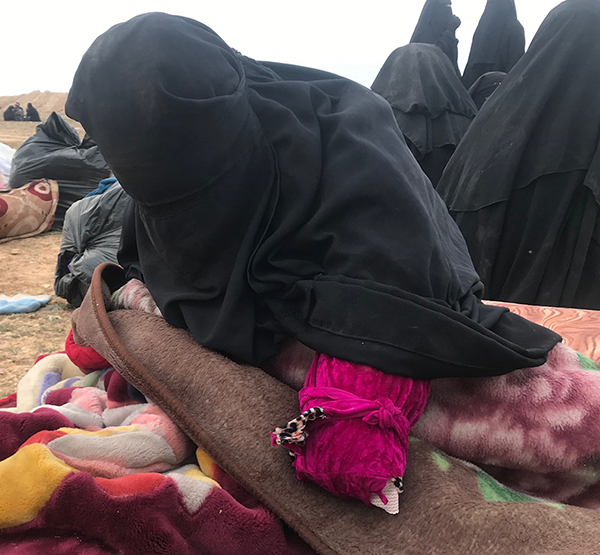 There are at least 2,000-3,000 civilians still with ISIS, although some fleeing people have told us there are more than that. We do not know the exact numbers but will help all we can. 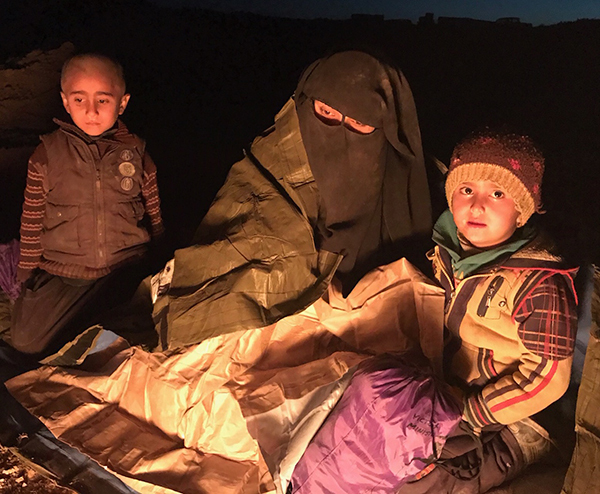 Most of the families fleeing are ISIS families and are terrified. 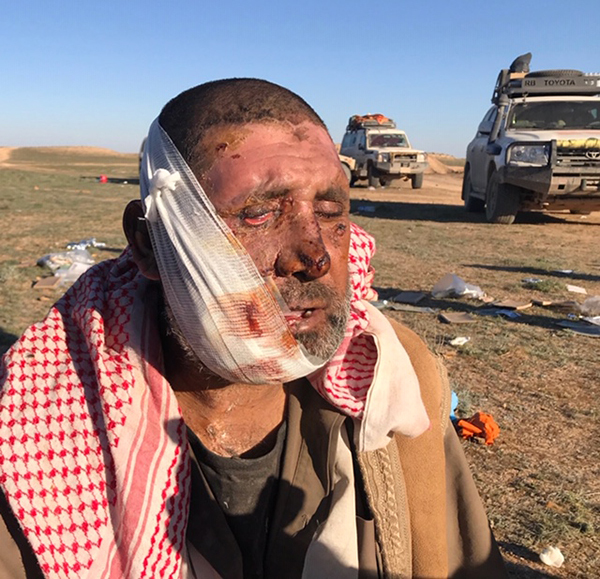 We tell them ISIS is finished, the Syrian Democratic Forces (SDF) are merciful, and they have a new chance from God. The evil way of ISIS led to this but now they have a way out and a chance to change their hearts. We pray with them and give medical care and food. 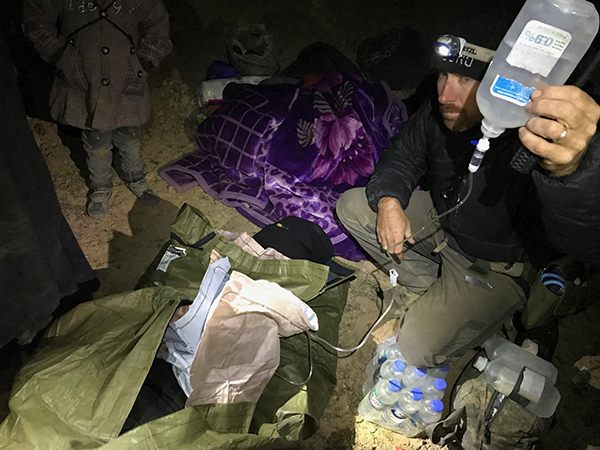 The temperatures are freezing at night and we have given all our blankets to the latest group who fled. There are babies and pregnant women here and wounded who are especially vulnerable to the wind and cold. Families huddle in the open and wait all night for transportation. With the help of the SDF, we are bringing more supplies here. 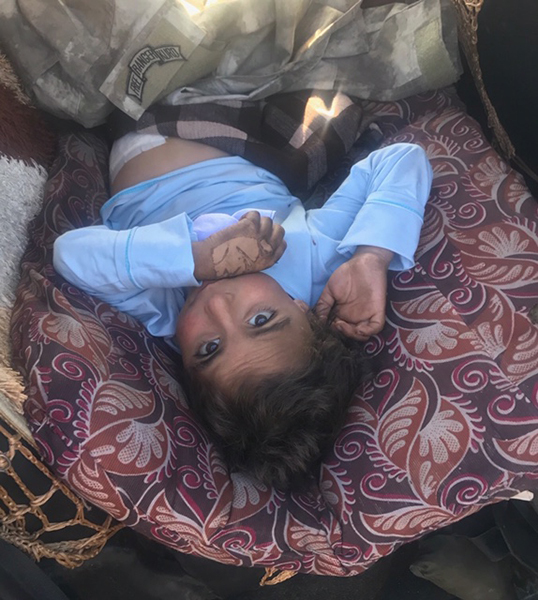 The refugee camp and clinic are too far away for newborns, sick or wounded to survive a night’s wait and then the drive. So, we are near an IDP collection site, back from the front lines working with the SDF to help these people. On Tuesday, the SDF helped us evacuate a shot child – they are good friends here. Thank you all for praying. The team treats a bleeding woman. A woman who lost her arm before receiving treatment from the medics. She is now resting after receiving treatment. 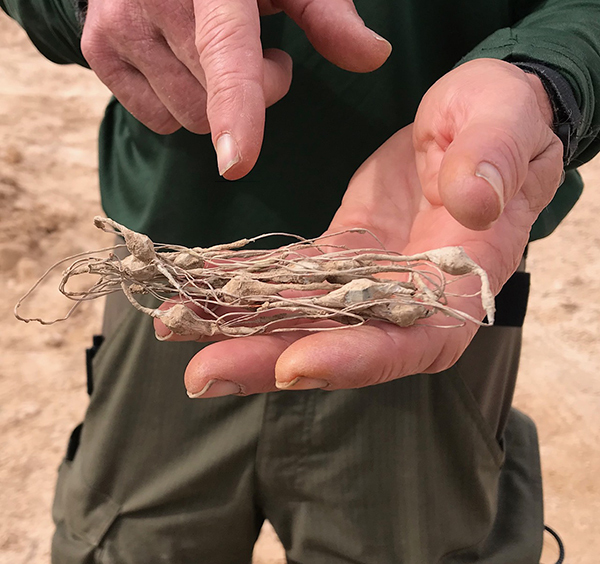 Crushed wire from an IED trigger device. A family takes shelter in a ditch after fleeing. Peter and Hosannah treat wounded civilians. 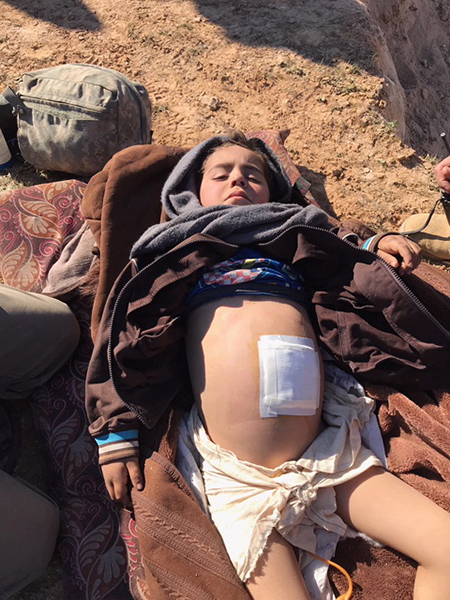 Above and below: some of the wounded who have fled the last ISIS stronghold.